As I write this, it’s 30°F and snowing lightly, with snow, ice and rain predicted for the next few days. It’s December in New Jersey. Oddly, I like winter. So what am I doing thinking about butterflies? 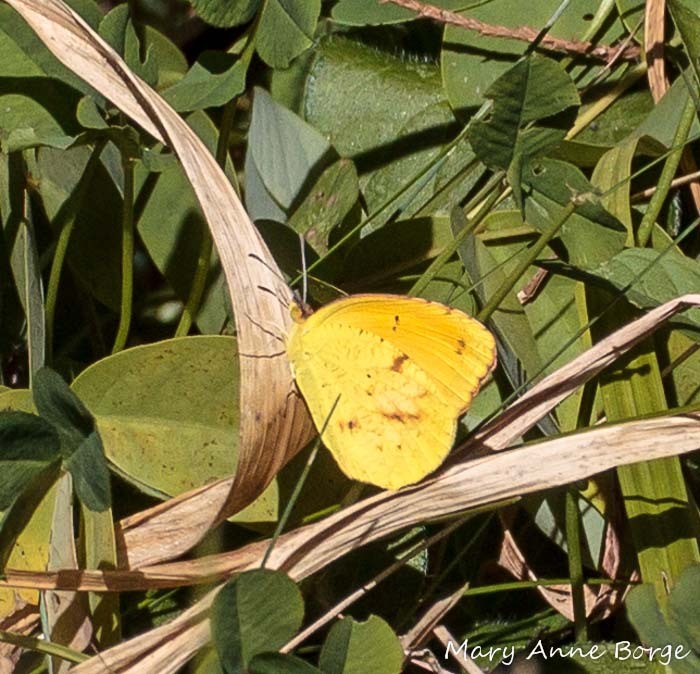 Since summer I’ve been puzzling over the fact that a butterfly species that is primarily tropical, the Sleepy Orange (Eurema nicippe or Abaeis Nicippe), has been seen regularly in summer across the Delaware River at Bowman’s Hill Wildflower Preserve, just south of New Hope, Pennsylvania. 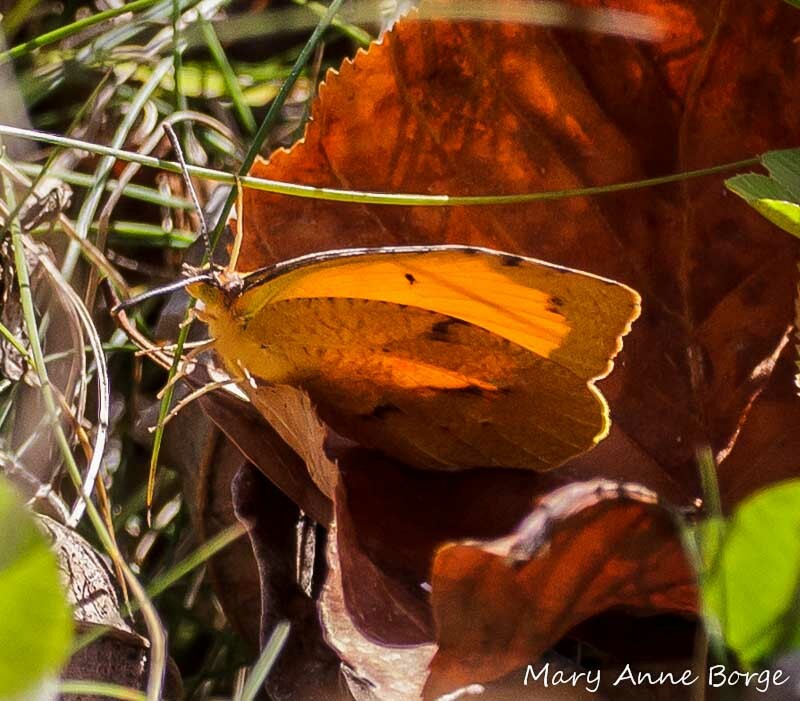 (See Sleepy Orange Butterflies are Back) This species is not thought to overwinter farther north than North Carolina. How is it that Sleepy Oranges have consistently been at the Preserve for the past four summers, and before that in 2006 and 2008? Is it random chance? Are they successfully overwintering here? Or have they evolved to be able to migrate south in the fall and back north in the summer, returning to the same location? Inquiring minds want to know (ok, I want to know), so I gave myself the assignment of observing them throughout the fall to see if I could learn anything that could help answer this question. 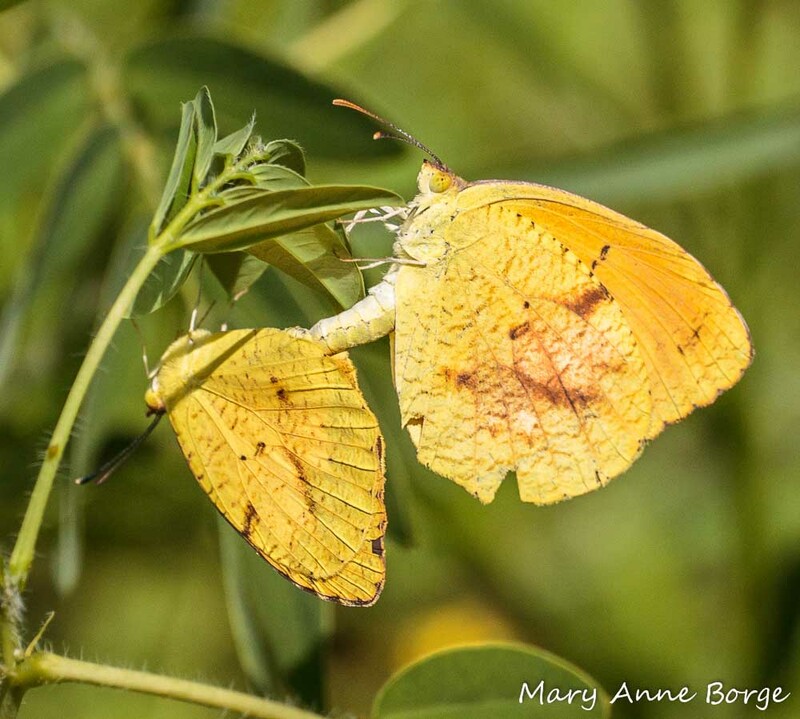 Throughout August the Sleepy Oranges could be seen mating, with the females taking the lead in selecting the location, usually on or near their favorite caterpillar food plant, Wild Senna (Senna hebecarpa). Naturally, this activity was followed by the females laying eggs. 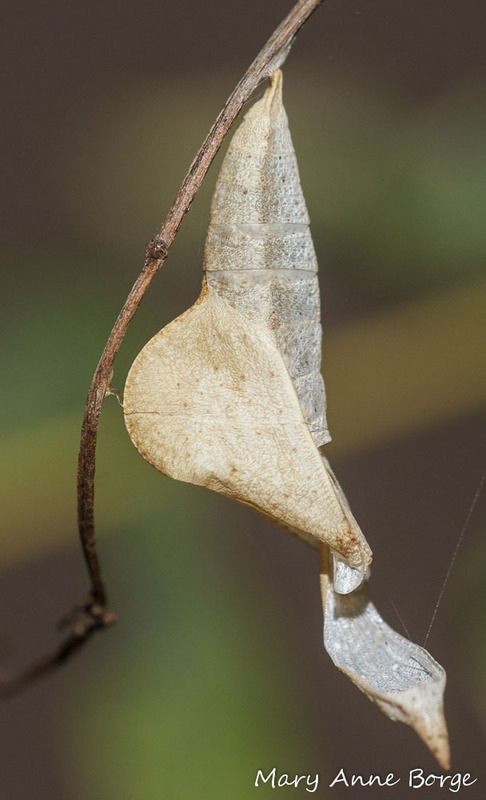 and chrysalis sightings throughout September. The chrysalises masqueraded perfectly as leaflets loosing their chlorophyll and changing to shades of tan, yellow and orange. 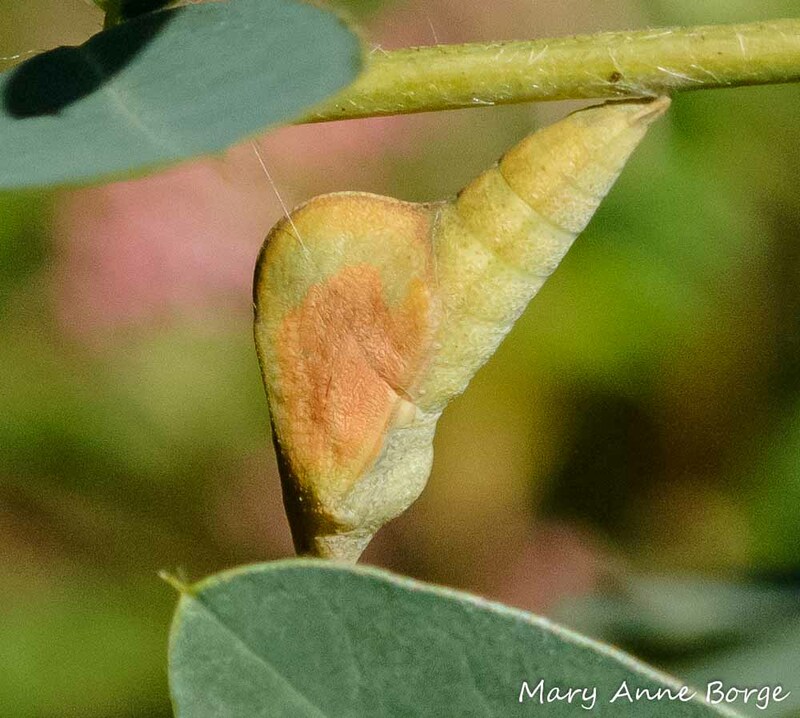 By late September, I still saw fresh-looking adult butterflies in their summer coloration form. In the south, where Sleepy Oranges are known to overwinter as adults in reproductive diapause, they have a different, darker coloration for this overwintering generation. 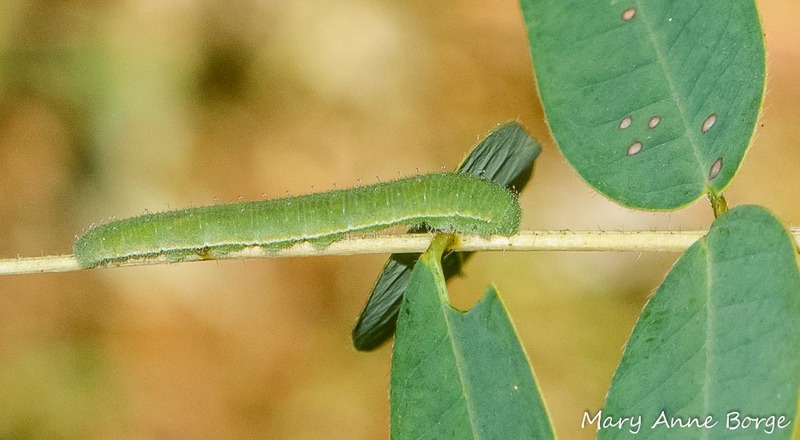 I observed my first individual with this coloration at the Preserve on September 24. 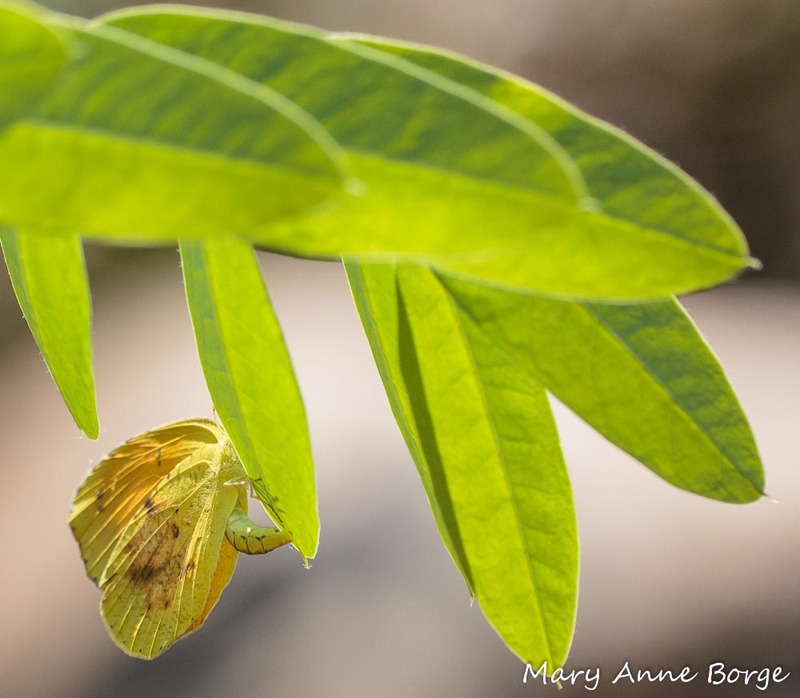 This butterfly had just emerged from its chrysalis. 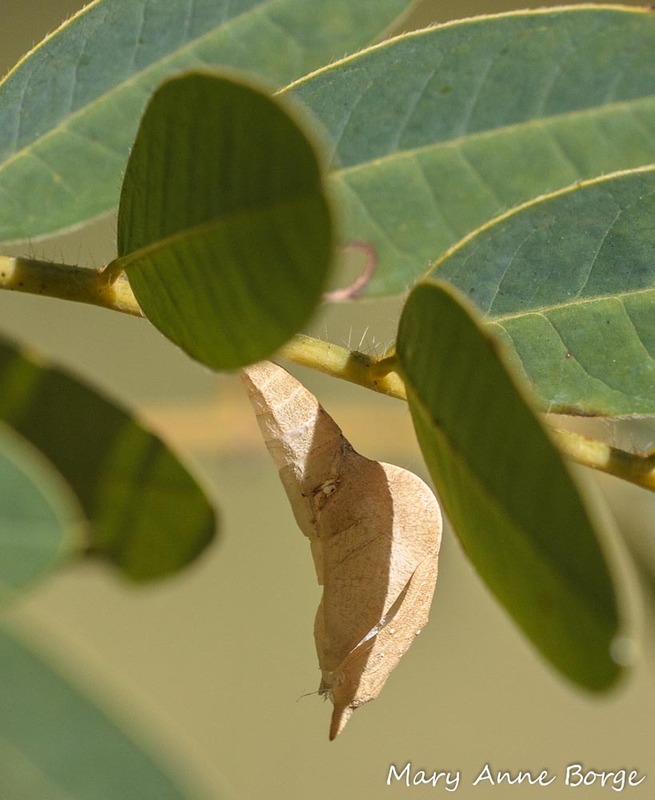 The tan leaf-like thing hanging behind and between the two leaves to the right of this butterfly is the recently vacated chrysalis, positioned perfectly as if it were a leaflet. Throughout October, every time I looked on a warm enough day I eventually saw adult Sleepy Oranges. 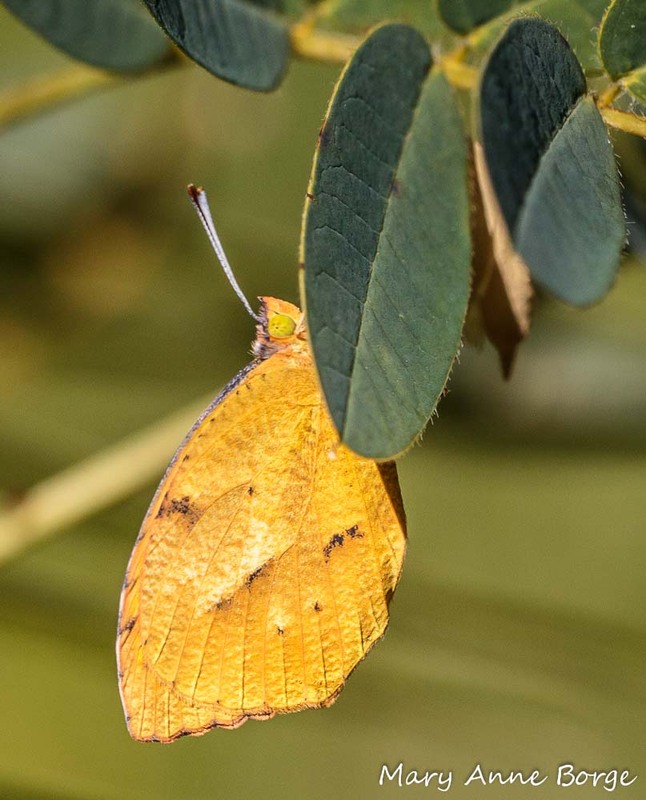 They usually made their appearance by flying up from the ground, first one butterfly, then two, maybe three or four, flying constantly, circling around each other, flitting back and forth, until they disappeared back down to the grasses and fallen leaves on the ground. I no longer saw mating, caterpillars or chrysalises. Occasionally a Sleepy Orange basked from a tree branch, safe in the camouflage of the changing fall leaves. 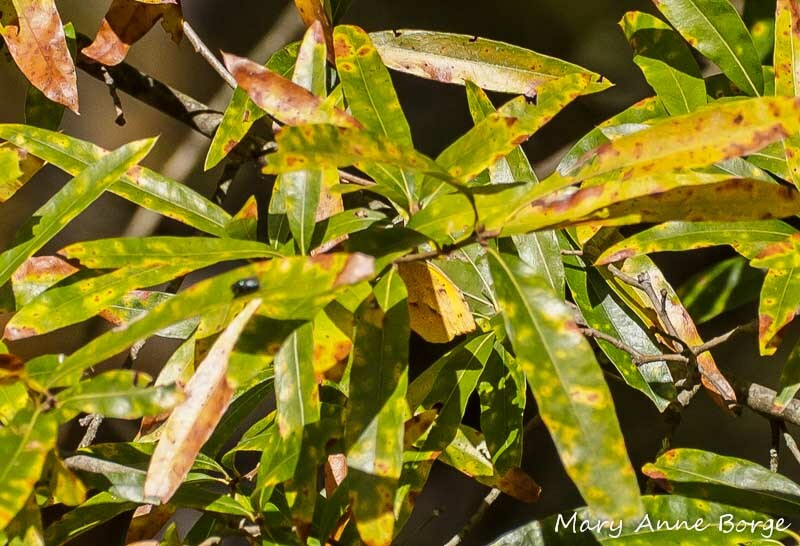 Sleepy Orange basking on Willow Oak – Can you see the butterfly? Only very rarely did I see them nectaring, although they may have been feeding more than I was able to observe, possibly on blossoms of young plants at nearly ground level, like this aster. The spot where I saw the butterflies most frequently is a small meadow area with lots of young plants (including Wild Senna, their caterpillar food plant) and exposure to afternoon sun. My last sighting of an adult was on November 2, a mild sunny day with a high in the mid-60s. Given the current temperatures, I’m pretty sure that will be my last sighting until next year. So it appears that the Sleepy Oranges are at least attempting to overwinter here, probably as adults, and probably in the shelter of the plants and fallen leaves on the ground. Lets see if they’re successful. This fall and winter is starting out a bit colder than normal, so even if they have survived the winter here in the past, it doesn’t necessarily mean they’ll make it this year. I hope they do! Even if they do overwinter here, it doesn’t exclude the possibility that they might also have a second strategy that involves migration. 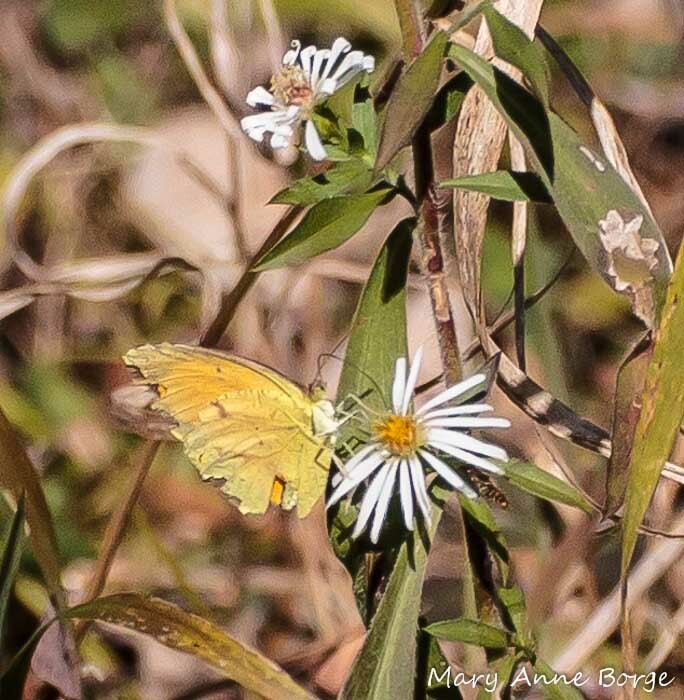 This entry was posted in Butterflies, Native Plants and tagged Abaeis Nicippe, Bowman’s Hill Wildflower Preserve, Eurema nicippe, nature, Overwintering, Ovipositing, Senna hebecarpa, Sleepy Orange, Wild Senna by Mary Anne Borge. Bookmark the permalink. Just fascinating, and so beautifully photographically documented. This seems to be original research, Mary Anne! Wonderful! Do you know whether any sleepy oranges did survive the exceptionally cold, long winter 2013/14? So far this summer, I’ve only seen one Sleepy Orange, on June 28. The good news is that that date is a bit earlier than I usually see them, so maybe some were successful overwintering. The bad news is that I haven’t seen any since. One added complication is that one area in which they were fond of sheltering was mowed in early July. So the results are somewhat inconclusive so far. Butterflies in general are a bit late this year, probably due to the cold snowy winter and cool spring. I’ve participated in 2 butterfly counts this month. Both had lower numbers than usual. But the numbers seem to be picking up. Keep your fingers crossed that we see more Sleepy Oranges! Wonderful article Maryanne! I wonder if sleepy oranges could have survived this latest arctic cold snap if any were trying to overwinter here? So you think the extreme cold hurt the species that normally overwinter here too? Thanks, Sue! I think the species that are normally here are fine with the arctic blast. I’m not sure how they’ll handle the wild temperature swings. And I’m really wondering what this weather will do to species that don’t normally live this far north. I guess we’ll find out in spring. Interesting! I have been thinking about all the different winter survival strategies of butterflies and gathering information. Observations of this kind are very useful. Do you know of any list of overwintering strategies? Maybe nobody has compiled one yet. 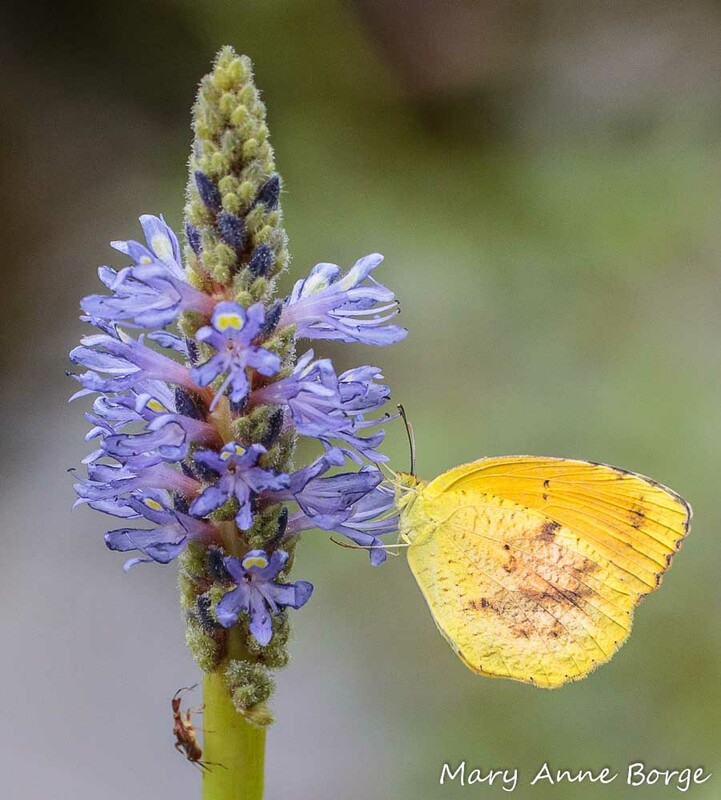 I don’t know of a list exactly, but for east coast butterflies, Butterflies of the East Coast by Cech and Tudor at least specifies the overwintering life cycle stage for each species covered there, where it is known. They also have general information about overwintering in their excellent introduction to the natural history of butterflies. Wonderful Article as always Mary Anne. Makes me want to get out more! That little coating of snow from yesterday makes this a beautiful day to get out! A very comprehensive post. Much enjoyed, very provocative. More in the Spring? Absolutely! As soon as I have any new information.